compensating people for conservation is happening at a regional scale. Local residents of Jamestown in Rhode Island, us, are paying farmers to delay haying their fields until after birds have completed nesting. Experts claim it as a unique test to establish investment markets for ecological services. The compensation is meant to protect habitat for bobolinks, a grassland-nesting bird whose population is declining in New England. Early hay Hay is grown for livestock and can be harvested twice a year and the first one (during May-June) usually interferes with nesting of bobolinks. 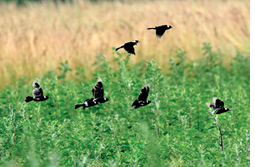 Bobolinks nest in undisturbed hayfields during March-April. "Changes in climate have caused farmers to harvest hay earlier over the years, cutting into the bobolinks' nesting patterns and leading to a decline in the birds," says Stephen Swallow, professor of environmental economics at the University of Rhode Island (uri). The mowing machines destroy the birds' nests, eggs and young. The researchers found that delaying the harvest provides sufficient time for birds to mature and flyaway. "For that, farmers needed compensation as cost of delaying the harvest and purchasing replacement hay. By doing so, birds could be easily saved without negatively impacting the farmers," said Swallow. "The Jamestown residents and farmers for the first time experimented to use a market approach to enhance ecosystem services," says Emi Uchida, assistant professor at uri. "Ecological markets are a way to correct such environmental problems by enabling businesses and individuals to express their values and invest in the environment," said Swallow.